Within the child lies the fate of the future. Maria Montessori was the first woman to practice medicine in Italy. A scholar of biology, psychiatry, anthropology, and medicine, she graduated from the Faculty of Medicine at the University of Rome in 1896. As a physician, Dr. Montessori was in touch with young children and became profoundly interested in their development. Through careful and exhaustive scrutiny, she realized that children construct their own personalities as they interact with their environment. She also observed the manner in which they learned as they spontaneously chose and worked with the auto didactic materials she provided. She studied children of all races and cultures in many countries around the world, soon seeing the universality of the laws of human development. She continued her observations throughout her life, widening and deepening her understanding until her death in 1952. Also a devoted humanitarian, she was three-times nominated for the Nobel Peace Prize for her advocacy efforts toward a more peaceful humanity. Maria Montessori was a scientist, and as a good scientist, she was earth-bound and highly spiritual in her pursuit of truth. 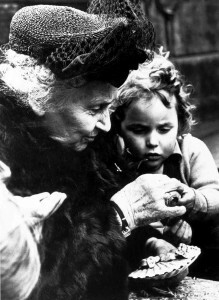 Through her studies of educational methods, she declared two principles as the foundation of Montessori pedagogy: the universal characteristics of the human child, and the child as a unique, unrepeatable, respectable, and admirable individual to be unconditionally accepted as one of life’s most marvelous expressions. 1896: Maria graduates to great public acclaim from the University of Rome School of Medicine. She is the first woman in Italy to receive a medical degree. Maria also studied anthropology, biology and psychiatry. As an early feminist she represents Italy at the 1896 Women’s Conference in Berlin where, among other things, she is a strong advocate for equal pay. 1896-1907: Dr. Montessori’s work brings her into close contact with children. During this period, the Italian Minister of Education appoints her as the Director of the Scuola Ortofrenica. This institution was dedicated to the care and education of youngsters that were considered “cognitively challenged”. Through the development of her Montessori method, many of these 8-year-old students are able to pass standard testing with above-average scores. 1907: Dr. Montessori opens Casa dei Bambini or “Children’s House,” for children ages 3 to 6 years in one of the poorest neighborhoods in San Lorenzo, Italy. 1913: Dr. Montessori makes her first visit to the United States. ; Montessori Educational Association is founded by Alexander Graham Bell and his wife, Mabel. 1915: Panama-Pacific International Exhibition in San Francisco: Dr. Montessori receives international attention with her “glass house” schoolroom exhibit. During this visit, Dr. Montessori leads a teacher training course while in the states. 1922: Italian government asks Dr. Montessori to return to become a government inspector of schools. 1929: Dr. Montessori founds the Association Montessori Internationale (AMI) in Amsterdam, Netherlands, with her son, Mario, to ensure preservation of her educational principles. 1939: Dr. Montessori and her son travel to India to give a series of teacher training courses. Both are detained in India during World War II. 1947: Dr. Montessori starts a training center in London and continues to spend time in India. 1949: Dr. Montessori is nominated for the Nobel Peace Prize. 1950: Dr. Montessori is nominated for the Nobel Peace Prize. 1951: Dr. Montessori is nominated for the Nobel Peace Prize. 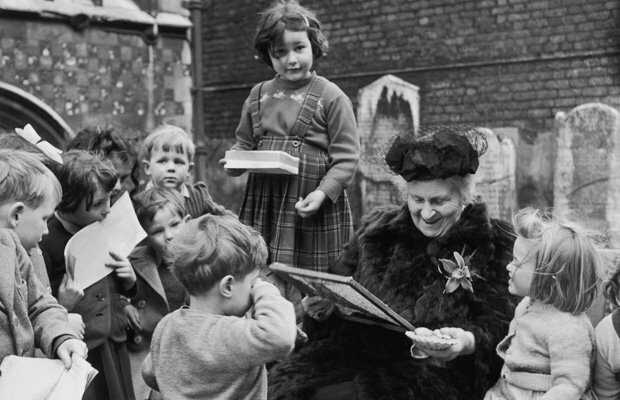 1952: Dr. Montessori died in the Netherlands assured that her legacy would be continued through the work of the Association Montessori Internationale.